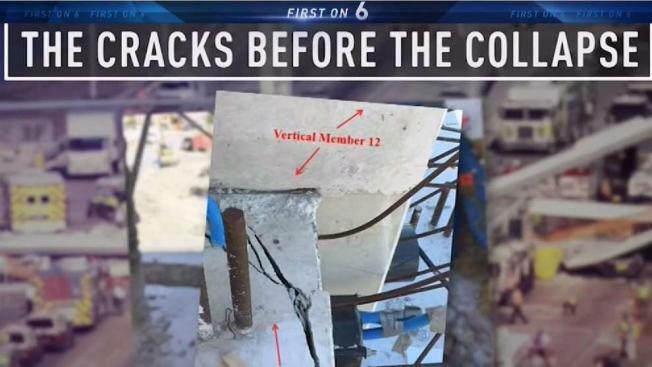 The latest NTSB report on the FIU bridge raises the question if the collapse could have been prevented. NBC 6's Jamie Guirola reports. 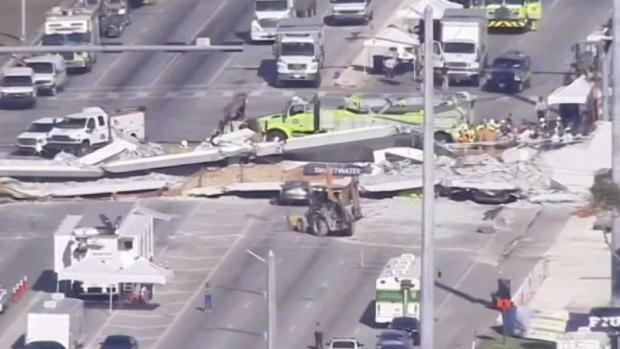 Large cracks were seen in the Florida International University bridge just one to two days before it collapsed and killed six people on March 15, according to photos included in a report released Thursday from the National Transportation Safety Board. The cracks — reaching as far as four to six inches into the concrete — appeared on the 174-foot bridge after it was set into place on permanent bridge piers across Southwest 8th Street on March 10. The pictures, dated March 13 and 14, show large cracks on the north end of the bridge exactly where the failure occurred. Previous photos provided by the NTSB showed smaller cracks in the bridge before it had been lifted into place. But the cracks revealed in the latest NTSB investigative update are much larger. After the March 13 photos were taken, the project's chief engineer called the state to report the cracks, saying repairs would be needed but that safety didn’t appear to be a concern. So no one — not the engineer, the construction company, FIU or the state Department of Transportation — ordered the road be closed or the bridge shored up before repairs were conducted. The bridge suddenly collapsed on March 15 as a work crew was carrying out the engineer's orders to re-tighten rods that ran through a diagonal concrete truss — the same area that was cracking in the newly released photos. The report released Thursday noted that tests of the materials used in the construction of the bridge have "not indicated any notable material issues." Concrete, tension rods and steel showed no defects or other issues, and reinforcement rods that ran through the structure were installed just as the final plans had specified. That lends support to some engineers' theory that the problem had its roots in the bridge's design and, after cracks appeared, a decision to re-tension four rods that ran through two trusses on each end of the span. The final plans had called for those rods to be de-tensioned after the span was set in place — and they were, until the modifications were ordered. FDOT is refusing to release records to NBC 6 that could shed light on its role in the decision not to close the road below the bridges during the repair effort. The report released Thursday said investigators have completed the majority of the interviews they're conducting as part of the investigation and anticipates the remaining interviews will be conducted this month. The agency then will seek to announce a probable cause for the collapse and recommend steps to prevent a similar failure in the future.